Sleeping in the outdoors is always fun as it brings you back to nature. However, being stuck in your tent for the entire night without any air circulation isn’t. This becomes specially true during the warmer months where the high temperature can make staying in a tent unbearable for some. Solution? The best tent can. These are very inexpensive camping accessories you can bring along to help you stay cool inside your tent. They offer a nice breeze and let air circulate as well. Below we choose some of the best camping fans that will help you be more comfortable in your tent. They’re very portable and often come with lights making them a practical choice for your trip. Best Tent Fan: This battery powered camping fan uses a 4 D sized batteries for power. It doesn’t come with the battery so you’ll need to get those separately if you don’t already have them at home. One of the biggest advantages of the Coleman CPX 6 is that it is very compact compared to other camping/tent fans. This makes it a better fit if you’re packing light. Coleman does have a rechargeable cartridge set that allows you to plug in for charging. Though they sell that separately too. That may be a useful accessory to purchase with this fan though. The fan clips on using its magnetic base and steel plate or carabiner clip, which allows it to work with most tents. You can also have it stand up on the ground or a small box or platform while inside your tent. While you’ll notice that the fan is open and doesn’t come with a face guard, it is still safe to use even around kids because the blades are made from soft foam. This makes them safe to the touch should kids become curious or playful. The device also comes with four 5mm LED lights that provide up to 99 lumens. The light is in the middle of the fan, which helps you use it as a night light as well. You can select between white light or night light setting. You can select from 2 different speed settings, low or high. Using the fan, you can get up to 30 hours of run time at the low setting, or 10 hours. All in all, these features make it a great to bring when going camping. This is a slightly bigger fan, in terms of size as you have the entire chassis behind it. It measures 6.25” in diameter for the face of the fan and 7.25” from front to back. This device can be used as a freestanding fan or hanging from above. You can adjust the stand/hook depending on what mode you’re looking to use. Like the Coleman CPX 6 it also comes with a light on the face of the face. This unit does have more LED bulbs, with 18. Running on 2 D cell batteries, the fan is rated to go up to 30 hours on high speed and up to 50 hours when set to low. If you run both the light and fan, you can expect as much as 16 hours for each set of batteries. The lights offer a nice bright lighting in the tent during the night, while the fan, while not so big does push out quite a bit of air. Due to its size though, it works better for small sized tents. You can use it for medium or larger tents if you just want air circulation though. 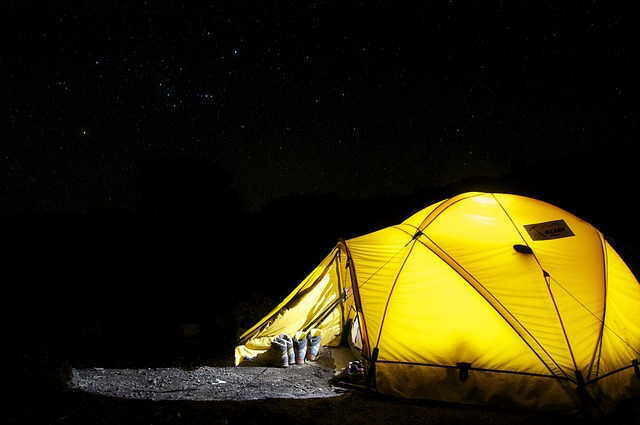 The cooler air inside your tent will help you get a nice night’s sleep outdoors. If you need something that offers more air then this is a good option. This isn’t a camping fan per se and more of a desk/table fan. However it is battery powered, very compact and portable. Plus, it comes with larger blades than most tent fans do. This is ideal for medium to larger tents where you need to cover more area with air. It also a better choice when you’re camping during the warmer months or in humid climates as you get more wind and breeze inside the tent. Measuring 12” by 11.9 inches, this isn’t the smallest of fans. But you do have to sacrifice that to get bigger fan blades for more air power. That’s just how it works. The good news is that it has a slim profile, folds up and has a carry handle which make it easier to bring along on trips. The unit runs on 2 speeds, and is a 10” fan. It lets you adjust the tilt so you can direct the air in the direction you wish. You can also choose to run it on batteries or a power adapter depending on where you’re using it. You do need 8 D cell batteries though to power it which is a bit more than what the other products in our tent fan reviews use. This is another compact 2-in-1 camping fan and lantern. The device is very portable and works great for 1 to 3 person tents in terms of providing air circulation. It also uses little power as you only need 2 D cell batteries to run it. The unit is water resistant and comes with a folding handle that doubles as a stand. This lets you set it down at the table conveniently. At the end of the handle, you can also use the hook to set the lantern/fan overhead. The 18 LED bulbs offer a good amount of lighting so you can see and do things during the dark. It produces 50 lumens and offers a 6 meter maximum beam range. This lets you carry it around too should you need to use it as a light outside. The fan meanwhile, can bet set to 2 different settings. Depending on the speed setting, you can get as much as 56 hours on the low setting with the set of 2 batteries and as much as 28 hours running on high. While they aren’t a necessity for anyone who’s going camping, having a tent fan sure is convenient as you can enjoy hanging out in your tent better. They’re especially helpful when you have problems sleeping due to the heat.